Glasgow City Council have granted planning consent for the erection of 48 low-rise homes on the site of two former 24-storey tower blocks in Kennishead. 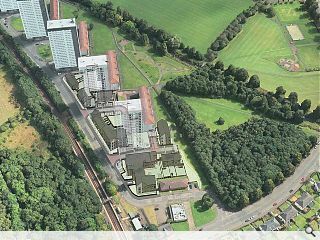 A mix of houses and flats will now be built Kennishead Avenue adjacent to the King George V park by the Wheatley Group to designs by Cooper Cromar, connecting to retained maisonettes and flats. New homes will be defined by feature gables flanking road access to serve as ‘gateways’ to the new homes. Connections to a community hall and the park will also be maintained. Who on earth wants to live in Kennishead? Urban suburb is all the rage right now...not that I would want to live there myself but locals normally want to stay where they know. In defence of Kennishead the train station is literally 30 seconds from that big tower block scheme, the M74 is 2 mins away by car, Silverburn is five minutes away, there's also the King George Park- Giffnock is a few minutes from there & Shawlands is ten minutes away, as is Pollok Park- its no my idea of Utopia but there's worse places to exist, maybe not many, but there such places...Whifflet? Off the top of my head. Kilbowie. Inchinnan. Bargeddie. Balornock. Barrhead. A random assortment of examples, even with the 'B's setting in a bit there- but would you swap any of them for Kennishead? #2 Charlie, give marketers a chance. Since Dennistoun is being advertised as Merchant city East, this ghetto could easily be upscaled to Shawlands South, New New Gorbals or Giffnock North. Mix with urban suburb blabbery and there you go. Buy in Govan now, if you've got money to invest. When the bridge is built West End (south) will be all the rage.